Pollen Street: The Cookbook, Jason Atherton. - Oddments Journal. Pollen Street: The Cookbook, Jason Atherton. What do we know about very fine dining? Well, for starters, like with various other things with the word Fine dotted in front of them (fine art, fine wine), we know that it can tend to be a tad intimidating, a bit alienating, and sometimes, oftentimes, sidling up to the line of stuffiness. But Jason Atherton, chef, writer and all-around overachiever, is here to change your mind about all of that. Pollen Street Social is a London restaurant — a very buzzy and intensely popular London restaurant, that is. It lives on Pollen Street (obviously) in Mayfair (fancy) and is the flagship restaurant of Jason Atherton, the former Executive Chef to Gordon Ramsay’s Michelin-starred Maze. Atherton and Pollen Street Social have a Michelin star of their very own, now — one which it earned within its first year — and since opening its doors in 2011, the restaurant has remained a steadfast favourite, with a cemented place on many a list ranking it as one of the UK’s best and most popular eateries. The book itself, Pollen Street: The Cookbook, is a very fine volume indeed. It’s wrapped in a beautifully designed hardcover featuring artwork by Ben Ashton, and all 400 pages contained within are printed on heavy, glossed paper stock. It feels luxurious — and weighty — but the simple design is easy on the eye, and like negative space on a fine white porcelain plate; the minimalist presentation allows the imagery — be it of the landscapes which breed the produce Atherton and Co use, or the delicious looking eats made with it — to shine. Atherton’s recipes are simple but meticulous. He is obviously hugely passionate about creating dishes which best highlight the incredible produce he is fortunate to have to work with, and it is that desire — to elevate good ingredients — that forms the foundational base for almost all of the recipes contained in his cookbook. The recipes are divided into eight sections: Canapés, Starters, Shellfish, Fish, Meat and Game, Poultry and Game Birds, Sweets, and Petit Four. There is also an Appendix featuring a further fifty recipes of sauces, stocks, oils, and the like. Most all recipes feature a photograph of the final product, followed by concisely written but easy to understand instructions and a list of ingredients and measurements. Standard recipe business, really. Atherton is a highly skilled chef, and his recipes are reflective of his skill. A beginner cook would likely have some difficulty managing some of his more complex and intricate methods, but a confident hobbyist would likely be able to manage with relieve ease. One of the most charming aspects of the whole book, apart from the deliciousness and the pride and enthusiasm for the beautiful and bountiful lands of the UK, is Atherton’s writing. He writes with a charming sense of approachability, and his tone is light and casual, confident, but encouraging. He wants people to try his recipes — he wants to help people enjoy great food, and to give cooking fine food for one’s self, a try. Jason Atherton’s Pollen Street: The Cookbook is a beautiful volume about glorious food. But as well as that, it is about the determination of a young chef, the passion of dedicated producers, and the importance of understanding and appreciating all it takes to make a good thing great. It is a fascinating read, and a keepsake for food lovers, home cooks, and adventurous readers, alike. 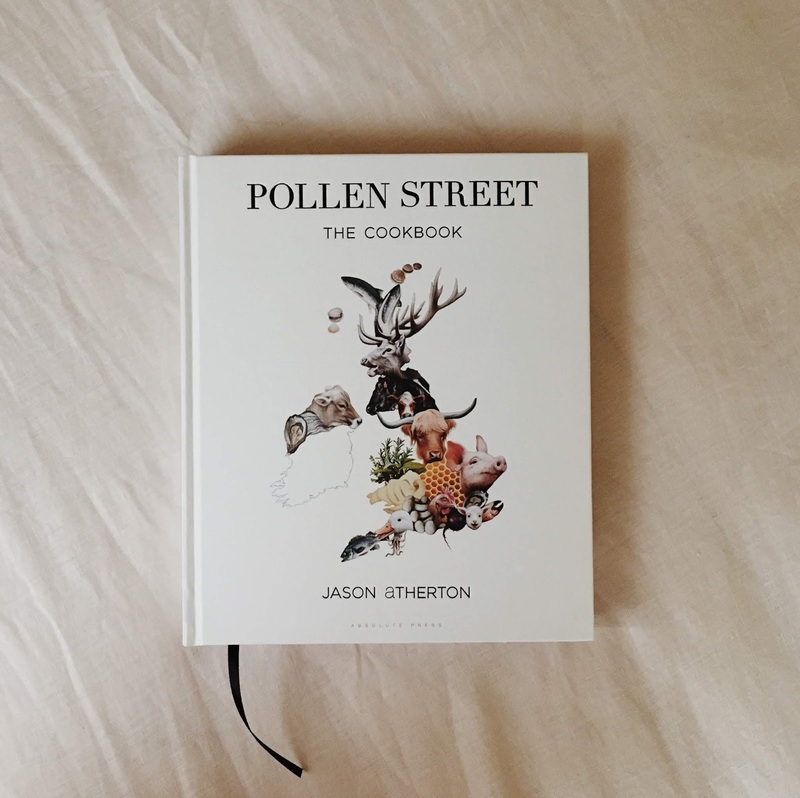 Pollen Street: The Cookbook by Jason Atherton is published by Absolute Press and distributed in Australia by Allen & Unwin.